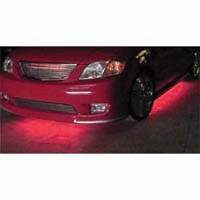 Platinum Neon Under Car Kits are for the Serious Car Enthusiast. Due to a lack of interest for "NEON" car lights in general - and an overwhelming INCREASE in the popularity of "LED" car lights, the Platinum neon undercar kit below is no longer available. Alternatively, we Highly recommend the popular FLEXIBLE LED UNDERCAR KIT. This LED under car kit is MUCH brighter then the Platinum neon kit - is much more durable - will draw less power from your car battery - will last longer (100,000 hours)- will fit any vehicle due to the "BENDABLE" LED tubes, and is 20$ cheaper then the Platinum neon kit. If you need performance and the highest quality Neon Car Kits available, then the Platinum neon under car kits made by PlasmaGlow is exactly what you need in a competition or street vehicle. The Platinum under car kit comes in many colors ( which are Very Bright) and include a 10,000V Transformer, two 50" tubes, two 38" tubes, easy installation instructions and all necessary mounting hardware to make them The most powerful neon under car kits in the world! The durable Lexan® tubes protect this kit for unsurpassed durability! If you are a professional looking for the highest quality neon under car kits, look no further than the Platinum neon Under Car lights. Included with this kit is the unbeatable PlasmaGlow Lifetime Warranty!